Free form Digital Progressive Lenses (FFD PALS) are Progressive lenses that are manufactured using a new digital free form technology. The new lens is far superior to conventional progressive lenses but not as widely spread as the older designs. 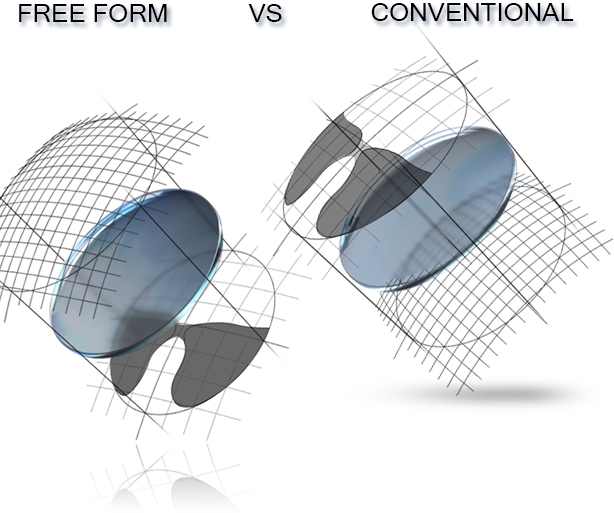 Free form Digital Progressive Lenses versus Conventional Progressives Lenses. In The last two decades, tremendous technological advancements and computer modeling enabled lens manufactures to develop and produce a new kind of Free Form Digital Progressive Lens (FFD PALs). This lens has many substantial advantages over a conventional progressive lens, providing the user with an almost perfect, distortion free, vision correction at all ranges. The first and perhaps the most important to the user, is that free form Digital Progressive Lenses provides a much wider field of vision. The first reason for this is that the visual correction design in FFD PALs is created on the back of the lenses rather than on the front. This allows to eliminate the key hole effect* common to conventional progressive lenses. In addition, computer aided surface designer software (Digital Ray Path) largely eliminates peripheral distortion and provides a field of vision that is around 20% wider than in a conventional progressive lens. Free form digital progressive lenses are called Free form because they can be fully customized. Manufactures of the lenses are not limited by a fixed or a static design, but can fully customize your vision correction for optimal results. In the same way a tailor fit you with a new outfit, different personal measurements are taken into the account. 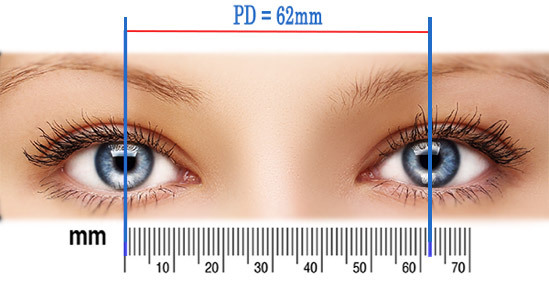 Measurements such the distance between the eye and the lens, angle at which lenses are placed relatively to the eyes and in some cases even the shape of the eye. These enables us to create a fully customized progressive lens that will give you the patient, the highest possible vision performance. In the old days, optical manufacturing equipment was capable to produce progressive lenses with a precision of 0.12 diopters. New Digital Free form Progressive Lenses are made using the digital ray path technology software which allows us to manufacture a lens that is precise up to 0.0001 diopters. Almost the entire surface of the lenses will be used for proper visual correction. 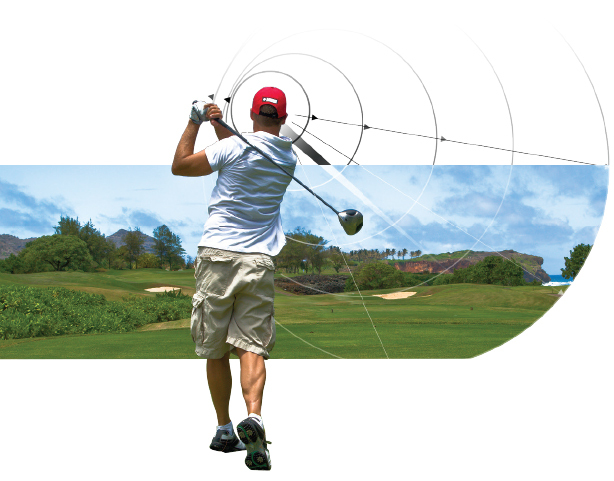 This technology also enabled us to produce a top performing progressive lens that can be used in wrap-around (high curve) sun and sports eyewear. In the last five years, Overnight Glasses dispensed several thousand Free Form digital Progressive and Single vision lenses to customers that had experience with older lens designs that were manufactured on conventional equipment. Our findings were, that customers who had a difficulty to adapt when changing their prescription, reduced it to almost zero, and that most of the users expressed owe and gratitude for enabling them to experiences the new technology. One very common opinion was that the experience of wearing these new lenses can be described as if they have just changed from a very old TV to the ` latest model of Digital 4K HD TV. The Bottom line is, using Free form digital progressive lenses for vision correction is improving quality of life. We guarantee that the free form digital progressive lenses we manufacture, are the most technologically advanced and most user friendly. 100% customer satisfaction guaranteed. *In the same way we peep through a keyhole, you are able capture more of the image the closer the keyhole is to your eye.